The holiday labor shortage is humbug for many Hawaii businesses that are stretched thin trying to cover extended holiday hours and extra traffic with shoestring staffs. Maui Divers Jewelry Design Center at 1520 Liona St. is always looking to train new employees, as well as their present employees to keep them up to date. 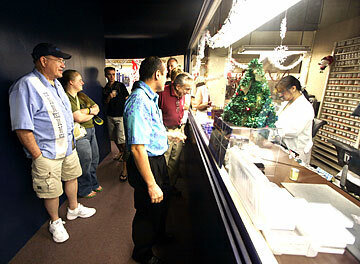 Julio Miyashiro, on the right of the tour group in the top photo, conducts a tour of the jewelry-making section of Maui Divers. ONE OF the things that Ala Moana Center store manager Maile Shimabukuro-Pascual wants for Christmas is more employees. Shimabukuro-Pascual, manager of the quirky and irreverent David & Goliath Presents The Stupid Factory store, thought she had enough employees by October to handle the coming seasonal rush. However, she lost staff to turnover and now, with only 14 shopping days until Christmas, is looking for both part-time and full-time help. Shimabukuro-Pascual's Ala Moana store is just one of the many this season that are still advertising holiday openings. Restaurants, resorts and retail shops all over Oahu are still looking for a little holiday relief. "I've had to work about four extra shifts and I've been giving out overtime," Shimabukuro-Pascual said. "The only thing that has saved us so far is that sales have been a little soft this year." Maile Shimabukuro-Pascual, manager of David & Goliath Presents The Stupid Factory at Ala Moana Center, walks through the store. Hawaii's infamously tight labor market has created a humbug holiday for many retailers who have discovered that the number of applicants for seasonal jobs has dwindled, said Carol Pregill, president of the Retail Association of Hawaii. Typically, Hawaii retailers beef up their staff with extra employees during the holidays to compensate for increased consumer traffic and higher volumes of sales, Pregill said. Most island stores do between 25 and 40 percent of their business from October to January, she said. "The tight labor market gets worse at the holidays when retailers have to work longer hours," Pregill said. "Everybody is stretched"
Like savvy shoppers in search of holiday bargains, the smartest store managers begin the push to find holiday employees early, said Judy Bishop president of Bishop and Co., a local staffing company. If seasonal employees aren't in place by Halloween, store owners and managers know there's a good chance they'll be pulling more shifts and paying more overtime, she said. .
"A lot of businesses are trying to staff for the holidays and we're getting lots of calls from customers who are at their wits' end with seasonal hiring," Bishop said. "This is the worst it's been for employers. The job market is simply not loosening up." Three weeks ago, Dailyn Yanagida-Ishii, vice president of human resources for the Waikiki Trader Corp.,* was about ready to hit the panic button, she said. Yanagida-Ishii likes to overstaff her Le Sports Sac and David & Goliath Presents the Stupid Factory stores at the holidays so that there's no chance of worker shortfalls during the busiest season of the year, she said. However, this year, despite starting well before fall, the company is still about nine employees short, Yanagida-Ishii said. Maui Divers Jewelry conducts a training session at its design center at 1520 Liona St.
"We like to add about 25 to 40 percent more staff during the holidays," she said. "But right now, the candidate pool is just not there. I wouldn't say that we've been successful in seasonal hiring this year or that we'll be successful the next." In the past, many of those jobs were taken by college graduates or high school students. But this year, many seasonal hirers found that many students already had been scooped up as a result of Hawaii's historically low jobless rate. Hawaii's unemployment rate, which is the lowest in the nation for the third straight month, fell to 2.1 percent in October. By comparison, the nation's seasonally adjusted unemployment rate for October came in at 4.4 percent. "We're all competing for the same workers," Yanagida-Ishii said. "If you don't have a seasonal staff lined up by October, you kind of hit a rut because a lot of other retailers have already captured those folks." It seems like the labor market has been tight forever, said Bob Taylor, president and chief executive of Maui Divers Jewelry. According to state statistics, Taylor is right. Hawaii's monthly seasonally adjusted unemployment rate has been below 3 percent for the last nine months, and has stayed about 2 percent lower than the national average. About 644,009 Hawaii residents reported having jobs in October, while only 13,700 residents said they were out of work, making it extremely difficult for employers to find qualified or willing job candidates.. The state's booming construction industry also has caused a shortfall in seasonal employees because the building industry can typically pay workers a higher wage than they would get in service jobs. "We're short-staffed during the holidays and throughout the year," Taylor said. "We have about 730 employees for our 62 stores, but we need another 100 or so to continue expanding." Allison Takamoto, a saleswoman at David & Goliath Presents The Stupid Factory at Ala Moana Center, takes inventory. The store is still advertising holiday openings. Taylor said he doesn't attempt to hire seasonally despite higher sales and traffic volumes during the holiday rush. Instead, he prefers to beef up year-round training and incentive programs to keep current employees happy and increase the pool of qualified candidates who will consider his company. Right now, he needs workers to fill jobs at Island Pearls stores that will be opening shortly at the Outrigger Beach Walk and the Hilton Hawaiian Village on Oahu, Whaler's Village in Maui, and the Fashion Show Mall in Las Vegas. The chain also expects to open another Maui Divers Jewelry store at the Westfield Center in San Francisco, Calif.
"Since 1997, we've added at least two new locations a year," Taylor said, adding that staffing those locations has been a year-round challenge in Hawaii's tight labor market. "One of the best ways that we recruit staff is to offer $2,000 referral bonuses to employees who bring in workers that stay at least one year, he said. "We get about a third of our workers that way," Taylor said. The jewelry chain also offers all staff members either commission or bonus structures, stock ownership plans and at least two weeks of training before they ever enter a store. Diana Duenas, a store manager at the Maui Divers Jewelry store at Ala Moana, said she gave up a promotion at her last job to join Maui Divers' team. "I've been in retail for 15 years and I've never seen anything as impressive as this company's training program," Duenas said. "They should get a medal." In fact, the company recently was recognized by the Hawaii Jewelers Association for Excellence in Education. Bobbee Downs, a new employee who will be selling jewelry on board NCL's Pride of Aloha by Christmas, said she's eagerly anticipating the holiday rush and the start of her new job. "I believe in this company," Downs said during a break from new employee training. "I have a Maui Divers dolphin piece that I wear all the time. My best friend has even asked me if she can have it when I die." Downs was one of about 10 new employees who will join the Maui Divers team by Christmas just in time to help those cash registers jingle. Given the holiday rush, it's comforting to have more staff on board; but with well-trained staff, any day of the year is a good day for sales, Taylor said. » Waikiki Trader Corp. was incorrectly identified as the operator of local Starbucks outlets In a story on Page D1 Sunday. The company operates only the LeSportsac and David & Goliath Presents the Stupid Factory stores in Hawaii.